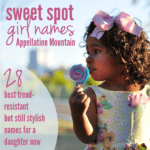 The new US baby names popularity data comes out next month, which makes it time for Trendwatch 2019 predictions. Every year, I try to predict 30 names likely to tip into the US Top 1000 when the data is released. This list covers the 2019 boys predictions; the girls will follow later this week. My usual date disclaimer applies: strictly speaking, we’ll evaluate Trendwatch 2019 predictions against the 2018 data, which is released in May 2019. I use the future date for two reasons: first, we’re evaluating the information fresh in 2019. And publishing Trendwatch 2018 months after the year has ended just feels plain wrong! You might wonder why the Top 1000 matters. Is there really a difference between a name ranked #983 or #1062? In many cases, the answer is no. Both names are relatively rare. Except, that name inside the Top 1000? It will appear on the official Social Security Administration list published here, and syndicated at baby name websites all over. That means more eyeballs will see that #983 name that a name just a few spots outside the Top 1000. And that means more people like me will write about it, more creatives naming characters will find it, and more parents looking for something different will consider it, too. All of this gives names inside the Top 1000 significantly more exposure than those outside the Top 1000. You’ll notice that the names I’m watching were usually given to somewhere around 150 to 250 girls in 2017. That’s because even a white-hot name usually won’t go from truly unheard of to the Top 1000 in a year. Game of Thrones debuted in April 2011. That year, 28 girls were named Khaleesi, a name – okay, a title – not previously heard outside of George RR Martin’s fantasy novels. In 2012, it was 146 girls, and 243 girls in 2013. But it didn’t crack the Top 1000 until 2014, with 369 births. Even an overnight sensation takes time to catch on. Bellamy has been on my radar for years. Credit goes to the Novogratz design family. Parents Cortney and Robert named their kids marvelously, including twin daughters Bellamy and Tallulah – who are now college-aged. But it’s trending now for lots of reasons. It’s a successor to Delaney and Avery. We’re still wild for Belle and Bella names. 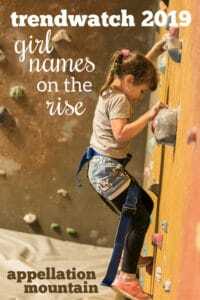 And three-syllable, ends-in-y girl names have always had their place, from Dorothy to Kimberly to Emily. But the rocket fuel behind Bellamy? The 100, a post-apocalyptic sci fi drama about a group of teenagers, including a handsome – and heroic – male character named Bellamy. (He’s brother to Octavia, another name sent soaring by the show.) While it’s rising fast for boys, too, it’s on the verge of making the girls’ Top 1000 first. Read more about Bellamy here. Lucky Clover makes for a thoroughly modern name, somewhere between Willow and Harper, with that sharp middle-v sound, too. While it’s been used in small numbers for girls for years, I think it’s mostly been reserved for pets – or maybe livestock, as I’ve come across more than one cow with the name, and a few dairies, too. But this is a different age in naming, and Clover’s many positives – including that auspicious meaning – far outweigh these concerns. Read more about Clover here. The Social Security Administration counts every spelling as a unique name. That can mean a rising name doesn’t break into the Top 1000 for a few extra years – think of Marlowe, which finally debuted in 2017, but would’ve arrived a few years earlier if Marlow and Marlo were factored in. Eisley caught parents’ attention when Lady Antebellum singer Hillary Scott chose it for her daughter in 2013 – but spelled it Eisele. (It’s a family name.) Isley is another option. But it seems to be Eisley that’s coming out ahead – and nearing the Top 1000 tipping point. I’ve yet to write about Eisley, but check back and I’ll update when I do. People who love baby names generally adore Elodie. Those on the outside sometimes dismiss it as incomplete (Melody-without-an-M) or confusing. (Is it Ella-Dee?) But this French form of a Germanic name is finally poised to catch on. A recurring character on television series Hart of Dixie gets some credit. So does our ongoing affection for Ellie names. Read more about Elodie here. Nora and Cora appear in the current Top 100. Florence recently returned to the Top 1000. It only stands to reason that flower goddess Flora would be next. It’s an ecovintage pick in the key of Lillie and June, sure to appeal to parents seeking something just a little bit different. Read more about Flora here. Harriet seems like a logical successor to Abigail. Everyone recognizes it. You can name a few notables by the name, like abolitionist and author Harriet Beecher Stowe. 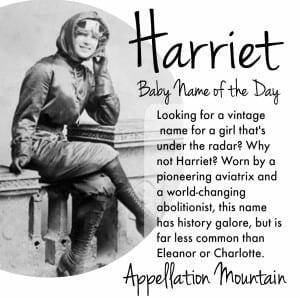 It comes with energetic nickname Hattie, now ranked in the US Top 500. Plus, we’re wild for Juliet and Violet and Scarlett. Another girl’s name ending with -t seems like a lock. But so far? Despite being widely familiar and very on-trend, Harriet has yet to make a comeback. I feel like this could be the year. The middle v strikes again! If we love Ava, Evelyn, Ivy, Olivia, Evie, and Everly, Jovie feels like a lock. It wasn’t a thing until 2003’s Elf came out, with Will Ferrell in the pointy shoes and Zooey Deschanel as his love interest. Her name – Jovie – was invented for the flick, presumably from the word jovial – cheerful. It’s a great name for a girl born at Christmastime, but really, it works for dozens of reasons. I’ve yet to write about Jovie, but check back and I’ll update when I do. There’s Harper and Piper and Parker, oh my. So why not Palmer? I love the subtle spiritual element – in medieval Europe, those who went on a pilgrimage to the Holy Land and returned with palm leaves were referred to as Palmers. I have it on Trendwatch 2019 for boys, too. It lands on the girls’ list thanks to a character in 2011 romcom Just Go With It, featuring Adam Sandler and Jennifer Aniston, plus Brooklyn Decker as Palmer. It wasn’t a hit, but it was enough to put it on parents’ radar. I’ve yet to write about Palmer, but check back and I’ll update when I do. With the rise of Penelope, some parents have considered Persephone as a logical substitute. It’s an elaborate name in the key of Alexandra and Isabella. And the symbolism can’t be beat – in Greek myth, Persephone brings the seasons with her, as she moves between her husband’s kingdom in the underworld and her earth goddess mother’s domain. It’s trended upwards in recent years, but hasn’t appeared in the US Top 1000 – yet. Read more about Persephone here. We’re in love with big, epic boy names like Maverick and Legend. 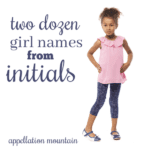 So maybe there’s space for some big, bold word names for girls, too. Like Hope or True, Promise feels like a universally admirable virtue name, something that’s positive regardless of your worldview. It’s more name-like than Steadfast, but less expected than Grace. I’ve yet to write about Promise, but check back and I’ll update when I do. Salem sounds bewitching, or maybe just plain tragic, thanks to the infamous trials that sent 19 people to their death in 1690s Massachusetts. But dozens upon dozens of other places share the name, and it actually comes from shalom – peace. It’s been a given name for generations, too. Former slave Salem Poor became a hero of the American Revolution. As a surname, it can also come from the Arabic salim – secure. It’s risen steadily in use for boys and girls alike, but it’s closer to the Top 1000 for girls. I’ve yet to write about Salem, but check back and I’ll update when I do. Ever since Ben Affleck and Jennifer Garner chose this fiery name for Violet’s sister, I’ve been wondering if Seraphina was the next big thing. It feels like a mash-up of the sounds in Sophia and Josephine, an elaborate name reminiscent of Isabella and Olivia. So far, that hasn’t quite happened – and yet, it’s slowly inched up in use, along with Serafina. The -ph spelling was also used for a YA fantasy novel series by Rachel Hartman. (There are dragons!) It’s a name that feels ready for prime time. Read more about Seraphina here. Who would’ve thunk that To Kill a Mockingbird, Harper Lee’s best-selling, prize-winning 1960 novel, would become the hottest of twenty-first century baby naming influences? But there it is. The author’s name briefly made the girls’ Top Ten (and it’s sitting at #11 right now), and Atticus has also gone mainstream. Scout could be next, a name that recalls the novel, but also feels capable and strong. Scout could easily be unisex, but the literary Jean Louise Finch tends to shift this one ever so slightly to the girls. I’ve yet to write about Scout, but check back and I’ll update when I do. Hattie is ahead of Harriet, and Millie ranks far higher than Millicent. So no surprise that I can see Winnie returning to the Top 1000, even if Winifred does not. Jimmy Fallon gave the name a boost when he chose it for his daughter in 2013. And this generation grew up on The Wonder Years’ Winnie Cooper. So no surprise that one of Sadie’s possible successors is winsome Winnie. I’ve yet to write about Winnie, but check back and I’ll update when I do. Nora and Cora helped put Flora on this list; they’re part of the reason Zora is here, too. Two more reasons? It means dawn in Slavic, and it ties to the legendary Harlem Renaissance author Zora Neale Hurston. Wait, make that three – because we do love a Z name. Just ask Zoe, Zuri, and Zelda. Read more about Zora here. 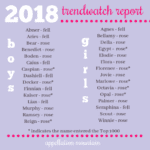 Those are my predictions for the girl names most likely to enter the US Top 1000 when we see the new data in May 2019. Any you’re watching? My 2018 baby’s middle name is Harriet and I can’t believe I don’t hear it more. It’s so refreshing and on-trend. I think Eisley and Elodie are potential hits too. If you want to hear it more move to New Zealand – it’s a top 100 name here. Australia too. We often seem to run ahead of US trends. YES! Definitely true, especially for revivals. It’s one thing that I often look at when making the lists. Though the US tends to be a little more ahead on new-new names, like Harper and Piper, than elsewhere in the English-speaking world. How in the world is Harriet not already in the Top 1000?? I think it will join, along with Elodie and Zora.